While shopping at Old Mistick Village the other week I was intrigued with a book we saw called Paint By Sticker Birds. I offered to buy it for Alec so we could give it a try. It has been so much fun! He has been working on the pictures as he listens to books on CD in his room and he was kind enough to let me assemble a bird too. You end up with beautiful images like this when you're done! What We're Eating This Week: With the crisp cool fall temps finally here we're eating lots of soups, stews, and casseroles! Like these two favorite fall meals. What I'm Loving: I found these Maple Pecan Pretzels in North Carolina and I just LOVED them. Oh so good! Thankfully I only bought one bag. What We've Been Up To: Lots and lots of fall hikes! While we haven't had the most colorful fall it is still so pretty and the temps are nice and cool for hiking. We are currently studying chemistry and the periodic table of elements and we wanted some fun hands on lessons to go along with what we're reading. 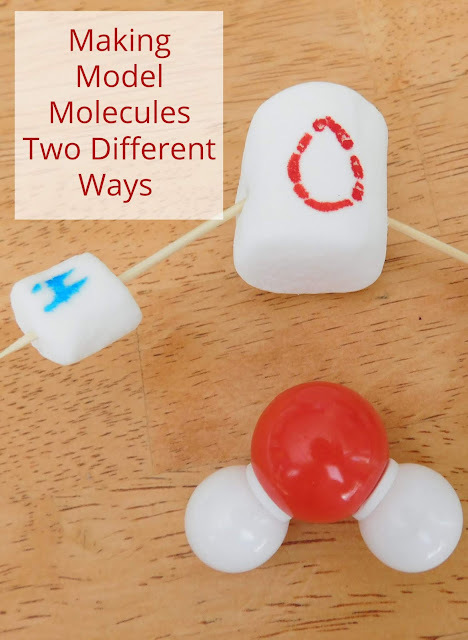 So we spent a morning building models of various molecules and just playing around having fun with the concepts of covalent and ionic bonding. I remembered we had this kit that we bought a few years ago and pulled that out along with some toothpicks, mini and regular sized marshmallows, along with some food safe markers. First I just let the kids play around with our kit and supplies making up their own molecules. Once they made up a molecule they had to tell me what they used to make it (each color represents a different element on the periodic table). Then we worked either with the kit or with the marshmallows to make a few specific models.